Attention! New rehabilitation program “Dream”! You can come at any time and get a quality training. For children, age 3-4 it is better to choose individual lessons. 1 hour – 48 Eur. 2 hours – 85 Eur. 3 hours – 115 Eur. Group training. 1 hour – 36 Eur for each. 1 hour – 26 Eur for each. 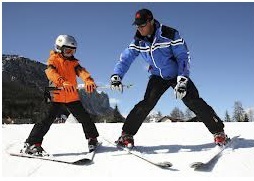 Choosing group training – please pay attention to skiers age and skiing level. 5 – 7 and 8 – 11 From 12 years children could be in one group with adults.